At the end of April 2018: profile drafting and weave structures among other things. I have been on an adventure to western Queensland. No, this blog will not be about that but in passing I will mention that I’m sure that the colours, textures and history in particular will find expression sometime in my work. The Longreach and Winton areas are extremely interesting destinations. 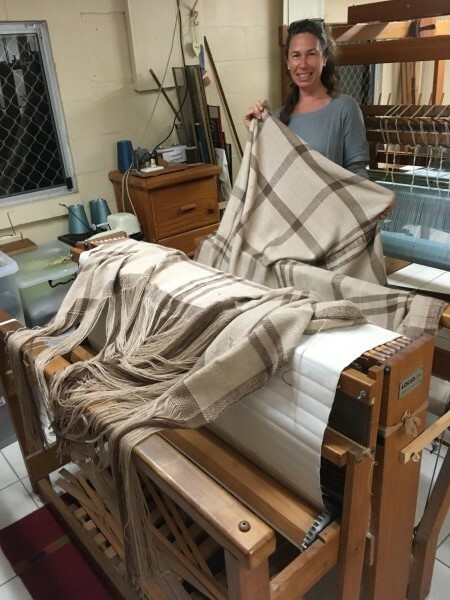 Rochelle spent a couple of days in the studio and finally finished her gigantic double width blanket. She has promised to bring it back totally finished. I bet it will keep her warm as toast. 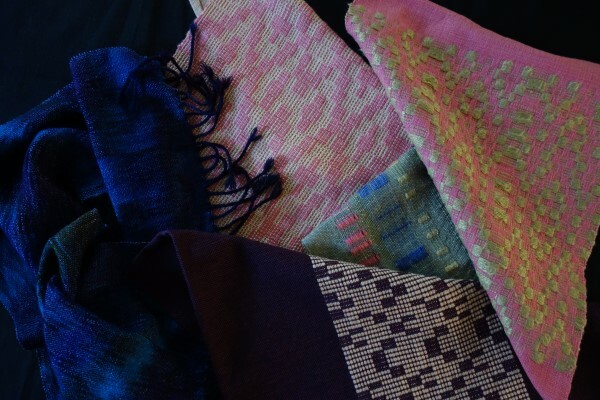 A reminder for others out there: the studio is available on a negotiated basis for students to come and weave. This month’s studio class was Beyond Basics where we started with profile drafting and extended into structure. 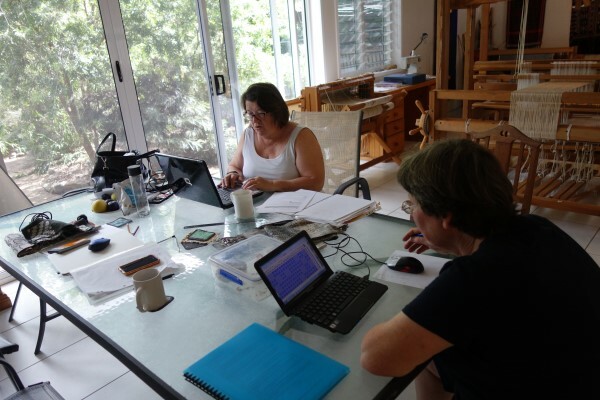 Jen and Hilary, both from Western Australia, produced a quantity of weaving files and actual weaving. This is an overview of the 5 day class. All the warps had the same profile drafts for the treading, while the treadling was based on each students profile draft. In this way all the samples related. 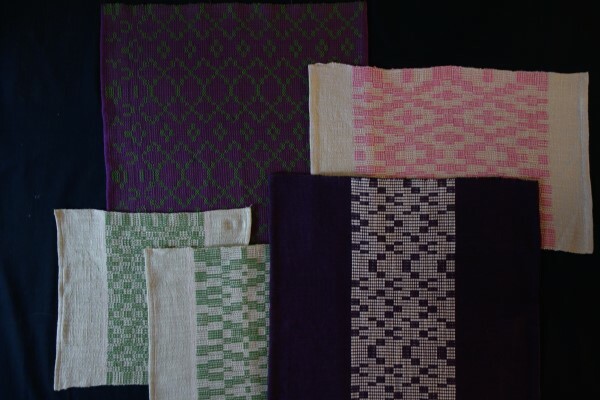 There were several hours spent on creating weaving drafts. 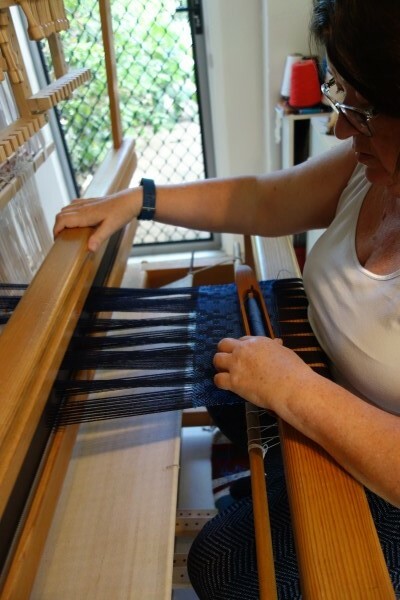 Jen weaving Atwater Bronson lace on a wool warp with a silk weft. 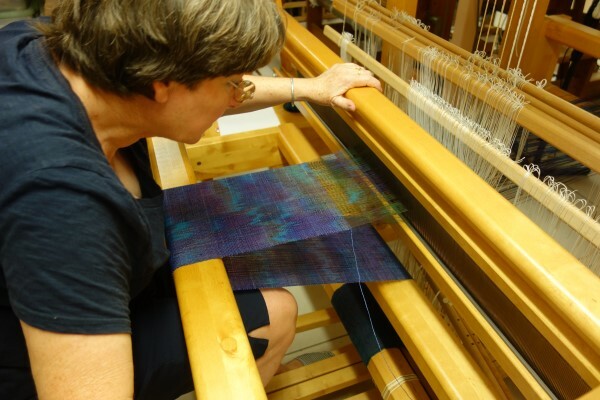 Hilary is weaving twill blocks on a draw loom. The pattern shafts are arranged as for the profile draft. What a great way this is to promote understanding of how profile drafting can be used. It’s also a fun experience. 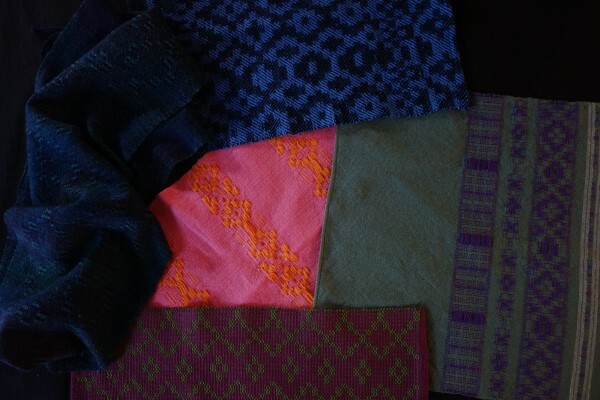 Fabrics include 4 and 8 shaft overshot, crackle, atwater and bronson lace, summer and winter, twill blocks. The following images were taken late on the last day when the lighting wasn’t all that good. Congratulations to both. They have some very beautiful results and all projects are totally finished. It was a great 5 days. What a lot of work they did! There was enough warp left over on two of the “overshot” looms for me to play. There had been much discussion on the length of supplementary weft floats when weaving overshot. 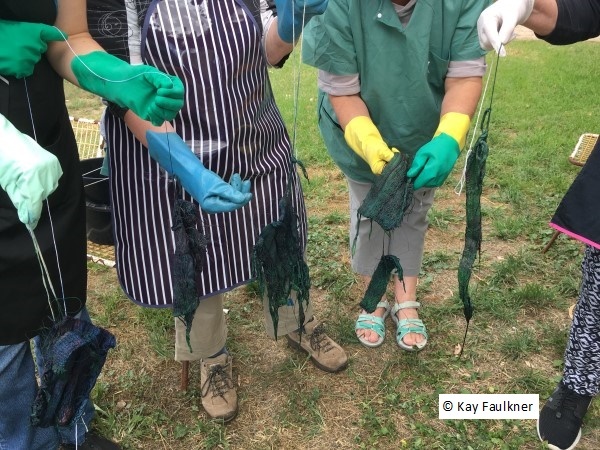 So the challenge was for me initiated by the students was to find ways to make use of these long floats to make interesting fabrics. I’ll share these 3 experiments. It was a great way to clear the looms and to enable students to really appreciate the potential of a structure. Of course there’s always woven shibori. 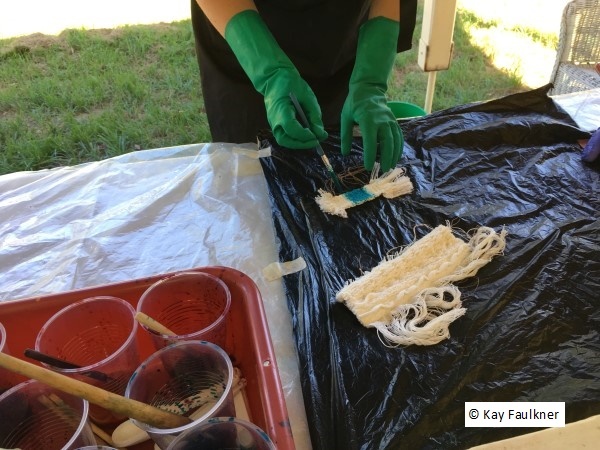 Any structure that achieves long supplementary floats is ideal for converting into weft shibori. Eventually I will get around to dye this hand towel. 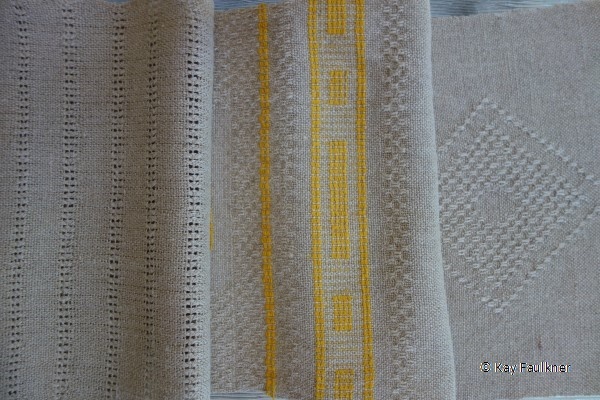 This hand towel uses just one block of supplementary weft which are then stitched into groups once removed from the loom. It’s a pretty effect. When weaving multishaft overshot (a 4 shaft profile draft converts to 8 shafts of structure) each block can be woven independently. This meant that I elected to use just the half tones with just weft floats on the front to weave this fabric. The pleating will stretch because of the wool/lycra yarn that was used. The finished result and the reverse side and before laundering. 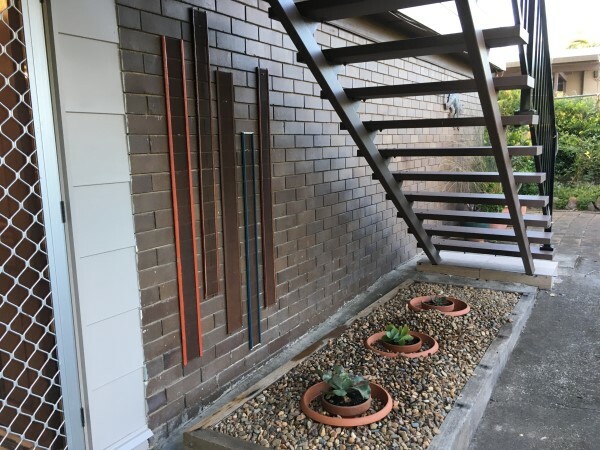 I thought the weavers may enjoy my installation. I had acquired these very rusty reeds over a number of years. Here, at the entrance to the studio, was the opportunity to do something with them. Next month: There will be no studio classes. I’m getting ready to set off on another textile adventure. 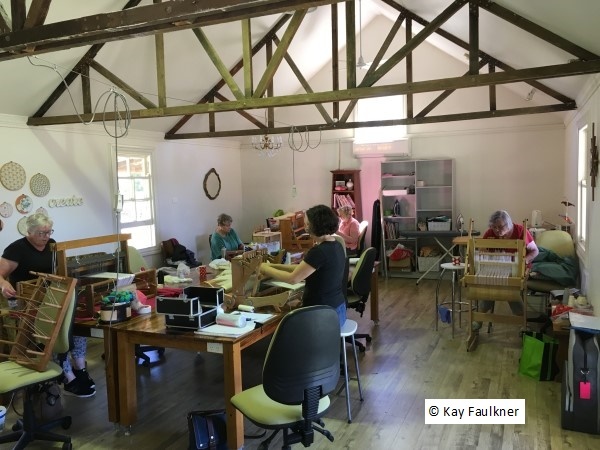 November 2017: A woven shibori studio class and textile exhibitions in Canberra, Bendigo and Tamworth. 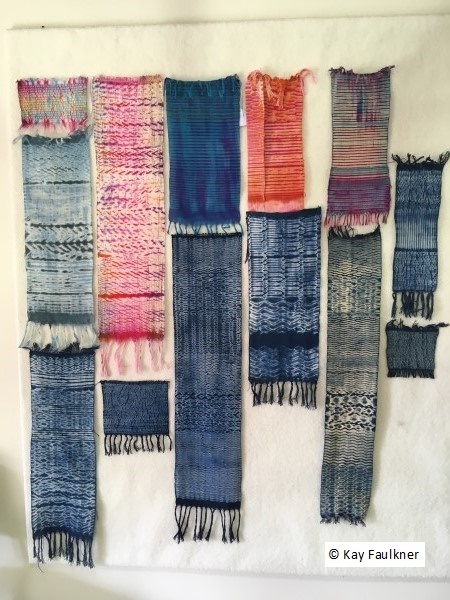 Philip and Annette spent 5 days in the studio working with various woven shibori techniques. 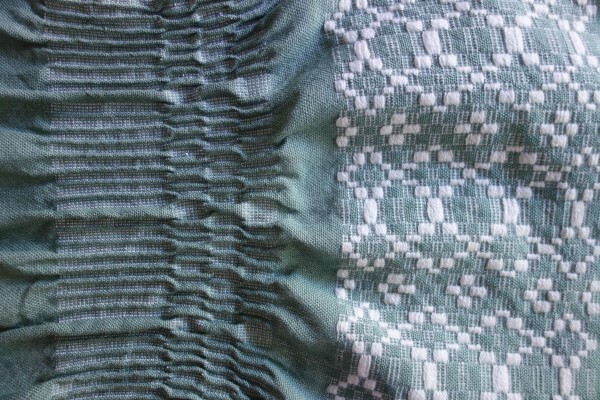 Looms were pre-threaded with both warp and weft shibori and different fibre/yarns combinations to explore as wide a range of techniques as possible. Firstly fabrics were woven that incorporated either a supplementary weft or warp thread. These threads were then pulled up very tightly. Hopefully the area that is not exposed will not be accessible to dye. Annette is pulling up one of her samples. 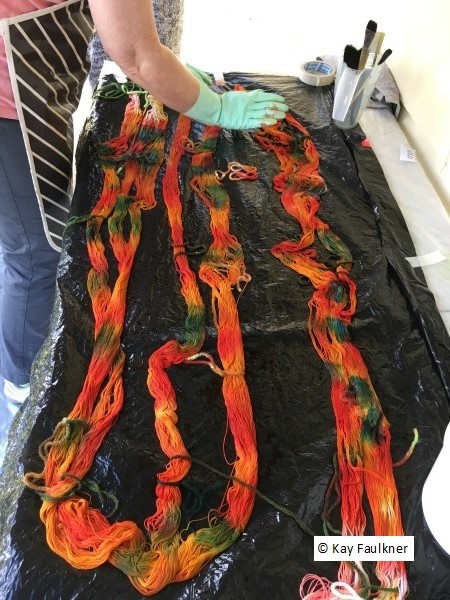 After dyeing these threads are pulled out exposing a dye pattern. Philip is in the process of removing his resist. The fabric is opening up to reveal the pattern. Once undone, the work was washed. Here’s a collection on the line. and closer details of work. Some of Philip’s collection, hemmed and totally finished. Annette had to leave early so I don’t have an image of hers. This month I was also fortunate to see some significant textile exhibitions. And a closer look at work by Jeanette Stock, Meredith Woolnough and Sally Blake. I have released the start of next year’s studio classes. Check out www.kayfaulkner.com.au or this blog for more details. There’s more to be posted. 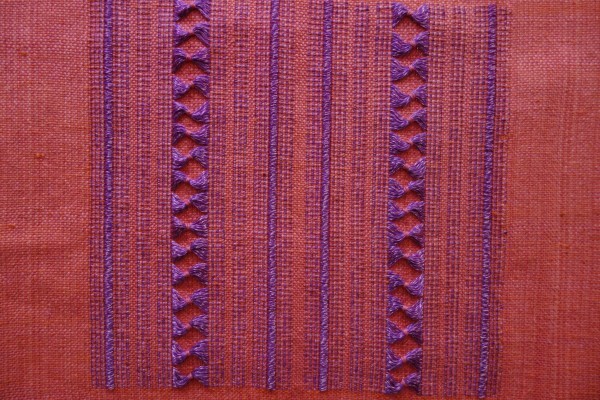 26-30 March (provisional) From a Twill Threading. 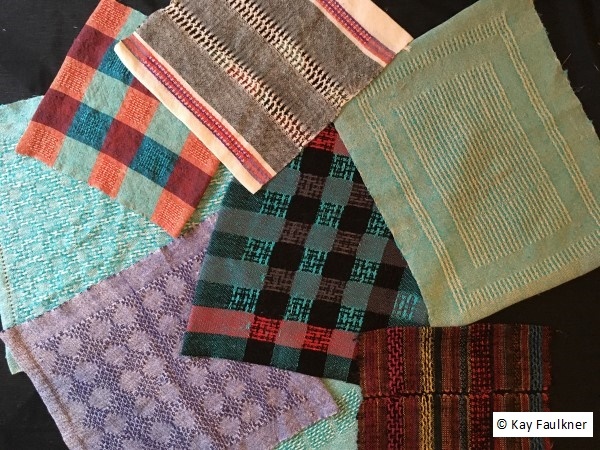 September 2017: Student work + John Becker’s book/Weaving informed by S E Asia. I’m in the studio this month. This blog covers both student work and some research. Scheduled was a five day studio class in Double Weave. For two weavers: Sharon and Marja this was their focus. Looms had been pre-threaded so that they could just weave. 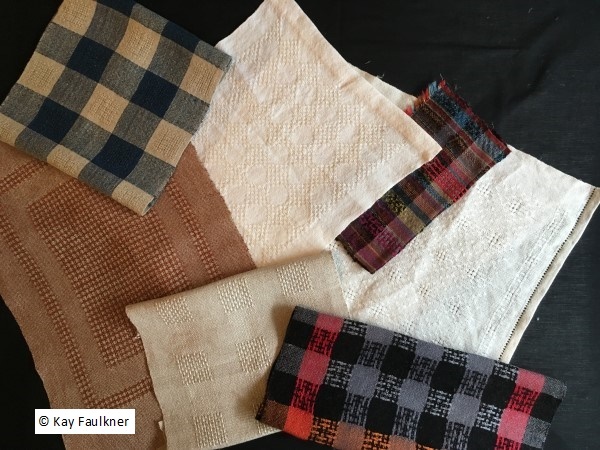 However there were theory and design activities often revolving around what they were actually weaving as well as developing an awareness of the diverse range of applications that were possible. The following are some images from the five days and a sample of what was attempted and completed. There was more but I missed taking some images. 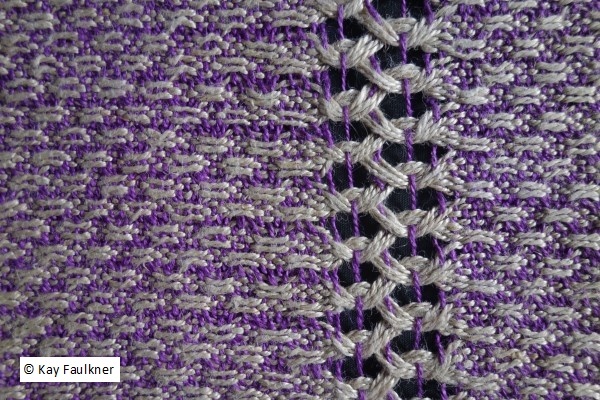 Marja wanted to master double weave pick up for imagery. She did! Windows of colour being woven: double weave blocks. From the same warp, their own designs on an off sett layer. Just a bit of fun: layers that swivel. 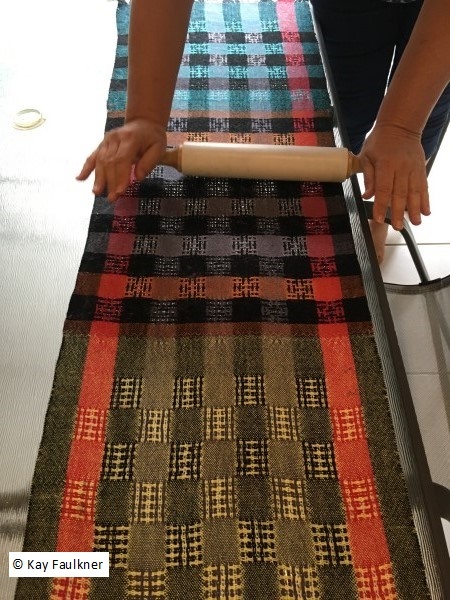 In addition to the scheduled work in class, Sharon took the opportunity to pull up and dye her fabric woven in the previous class. 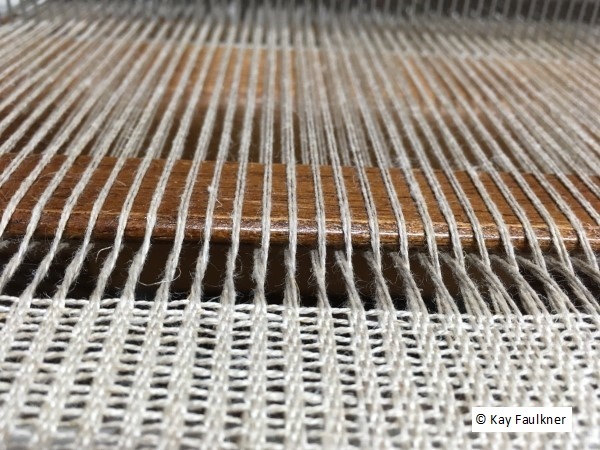 The technique was warp shibori woven on a warp of linen/cotton with a silk noil weft. The warp has been pulled up and dyed. Shown here is Sharon undoing her resist. This fabric is destined to become a blouse. 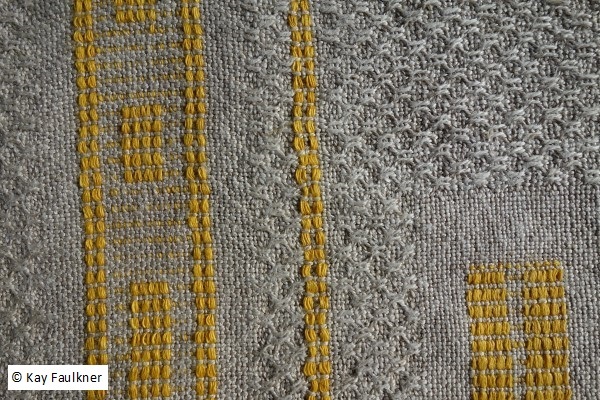 At the same time that Sharon and Marja were weaving double weave, Rochelle continued with her bird in Theo Morman. By the second day the weaving was completed. Now there is thought being given to the next steps in completing this wall hanging and a single repair to make. It is a gigantic achievement for a first time weaver. 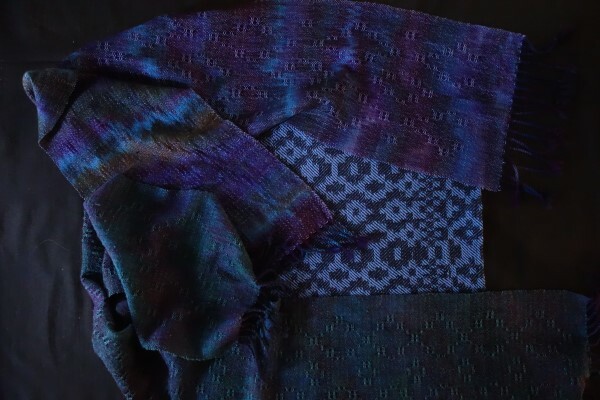 For her second warp, Rochelle decided to weave a throw in alpaca, plain weave and checks. Here it is finished in 3 days. 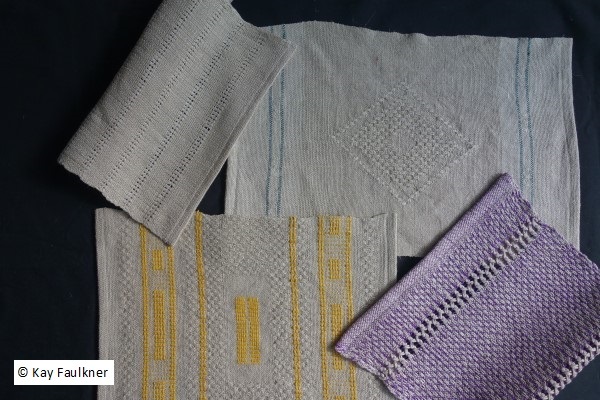 These weavers sure got through a lot of weaving and can certainly be proud of their efforts. I was certainly impressed by their dedication as they took full advantage of the studio hours. 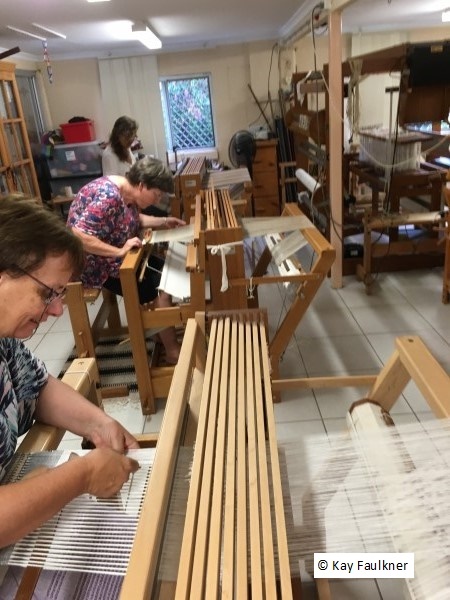 Of course while they were committed to what they were weaving, there were times of wonderful companionship and laughter. Special friendships have been formed. Some may question why Rochelle got to do other things than the listed course: double weave. I can be flexible. 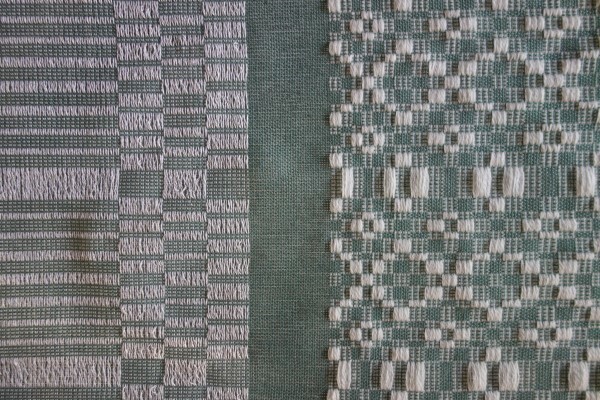 My aim is always to accommodate weavers who want to learn- no matter what the topic is. First in with a booking will always be welcomed. And if one class fills on a designated to a topic (remember class size is strictly limited), then I can always list a second. I have been “playing”. It’s always a good idea to take time off every now and then and explore a topic or do something different. 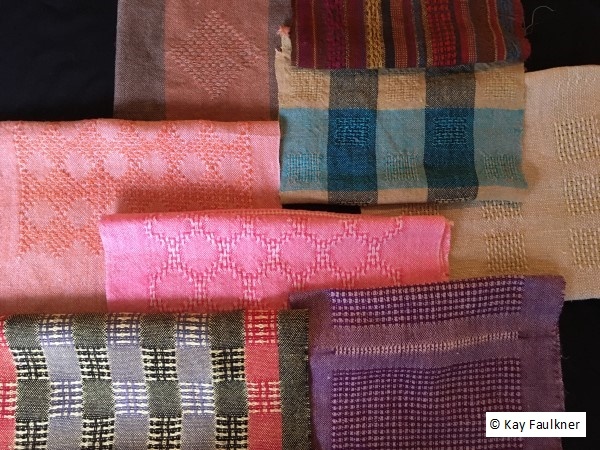 this technique using horizontal pattern storage from Vietnam/ Thailand/ Laos, got in common? Opportunity!! Firstly this is a new, second edition of John Becker’s book published in 2014 by NIAS Press. The information is basically the same but it does have a different layout and in particular a better size of illustrations. I am enjoying this edition which does away with the “need” to have the two parts of the original (below) which has the larger diagrams and drafts in the second “half”. Note that this edition has “with the collaboration of Donald B. Wagner” on the cover. It is due to his effort that there is an updated version. This is the original edition with the two halves. The diagrams in the main book were difficult to read so having the second supplement was beneficial. I was having a look through the new edition and not having gone very far was very excited to see a technique that was running parallel to some research that I was intending on following. 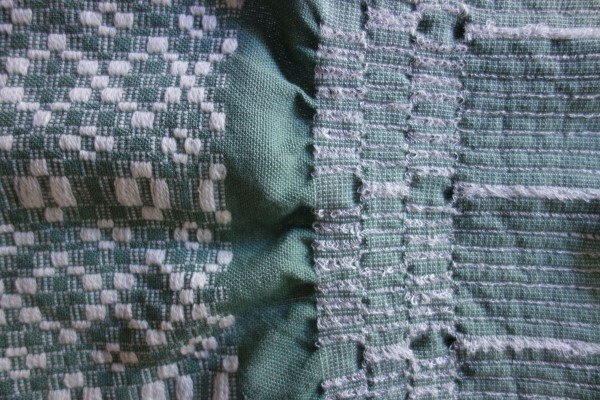 There is this textile that is in my collection and that was intriguing. 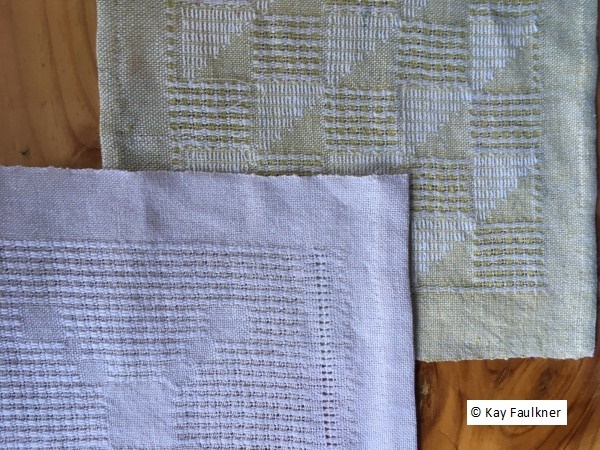 What I knew about the process in its weaving had commonality with what I was seeing in Becker. I won’t show that textile now as it will come in another post and will only muddy the waters now. However this and what I saw in Becker has sent me off in a new direction of “play” on the hybrid loom. 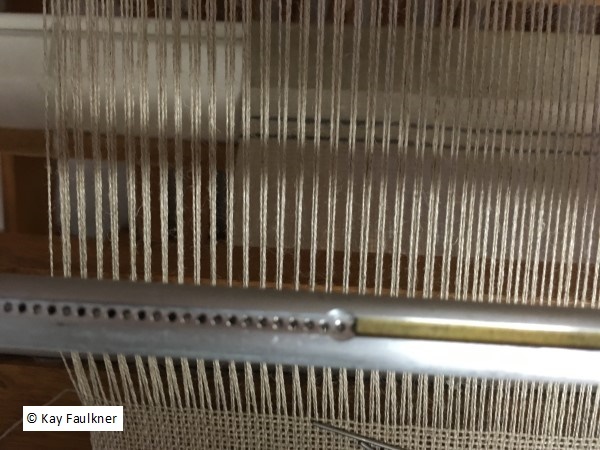 My hybrid loom had the remnants of a long warp. It has been used for previous “play” at the start of the year. The one thing that I have discovered about this loom is its great flexibility. Here was an opportunity to use it in a different way and maybe finish the warp. I will need to use it as a conventional countermarche loom for weaving rugs in a month or so and this warp really does need to be finished. The technique I was about to explore is on page 22 in the new edition for those who have it but it is also in the older one. The technique is from the Han Dynasty of China (206BC to AD220). Yes, it is also fascinating because it is so old. 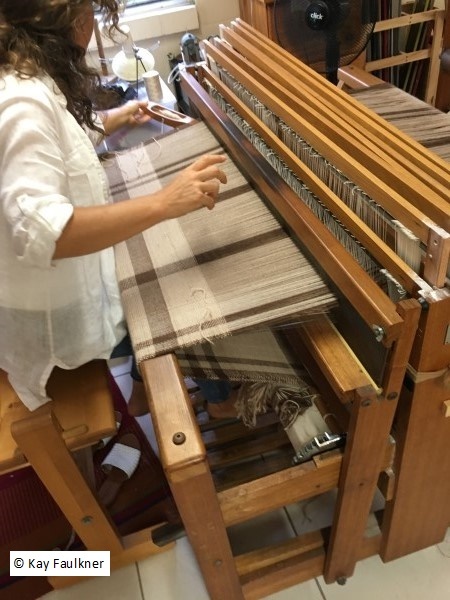 It uses one shuttle for weaving and combines plain weave being woven on two shafts with pattern being picked up and stored. 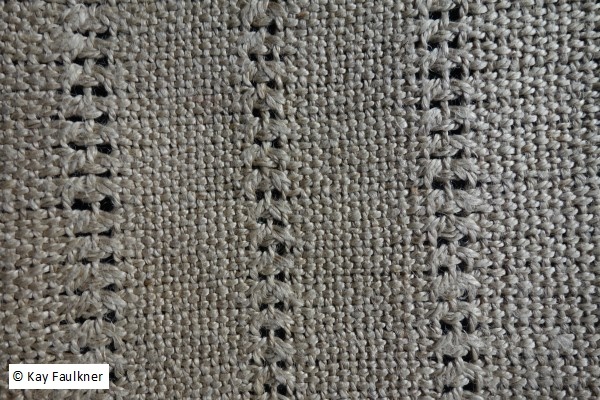 The result combines a pattern in warp faced twill on a plain weave background. Structurally it is excitingly simple. The book also shows a horizontal storage system being used. However, I also knew that I could store it on the vertical storage system. Initially this is what I used. The pattern is picked up in pairs, transferred to behind the shafts and stored. I have used the vertical system to store a single diamond motif. 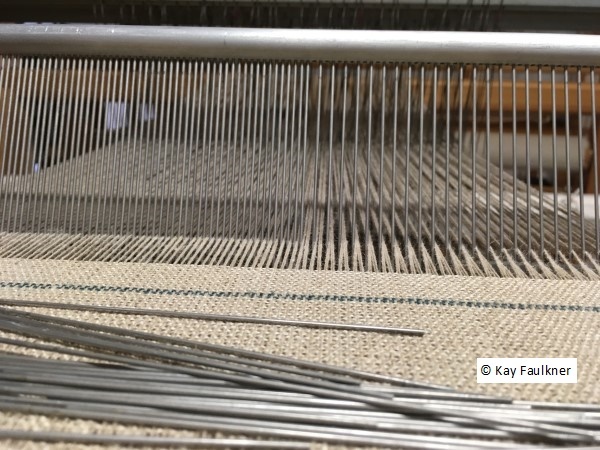 This may be used to weave the start or end of the entire motif. I started with this system because it was something I was familiar with. But here was the opportunity that I’d been waiting for. I would also try out using the horizontal storage process. It’s been on my “to do” list for a number of years. I wanted to understand its advantages and limitations. When asked in Laos why you would use one rather than the other, I had been told that the vertical storage has the capability to store a much longer warp. But how easy is it to use the horizontal system? What are the advantages or disadvantages? It’s usually only by actually using the loom that you can understand how it works. But then I took up the challenge and used the horizontal system. 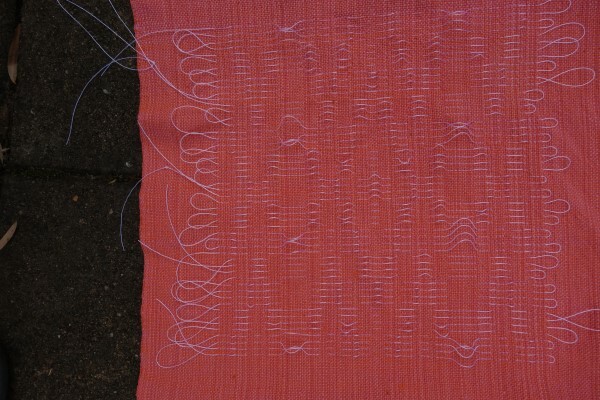 I learnt that the pick up requires the making of half heddles and got fast at doing half hitches. This is different to what is shown in Becker but in keeping with where I needed to go. Becker uses pre-tied loops. The knotting of half heddles with half hitches is quite efficient. This system also requires less yarn in creating the heddles than the full loops used by Becker: therefore less opportunity for tangles. I have also taken on board the heddle support rods that I had noted in Laos and Thailand. Using these created a mostly clean lift with few tangles and a very convenient way of keeping them in sequence. Once the design was picked up and stored, weaving progressed reasonably quickly. 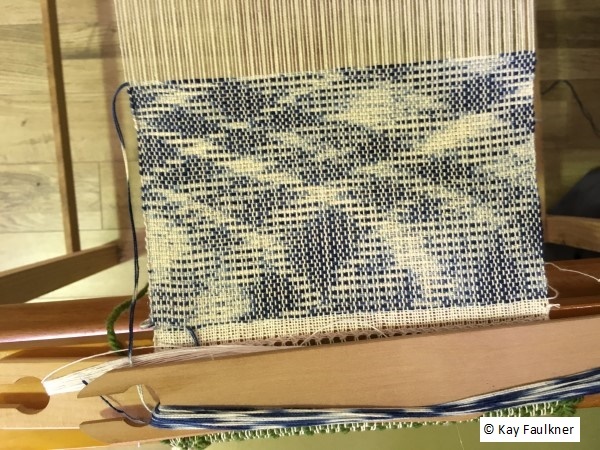 To weave the design all I had to do was raise the heddle bar, transfer the pattern to behind the reed and weave two rows of plain weave. 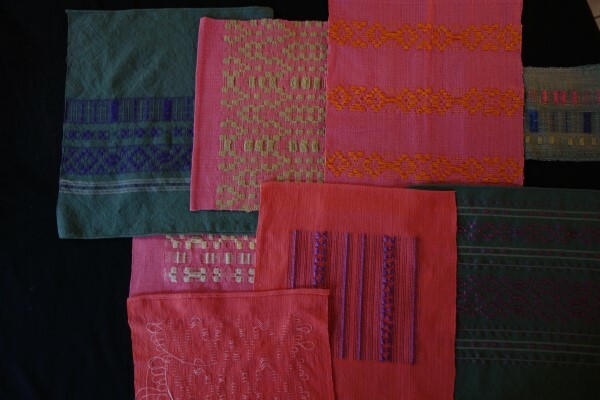 The first design is woven. 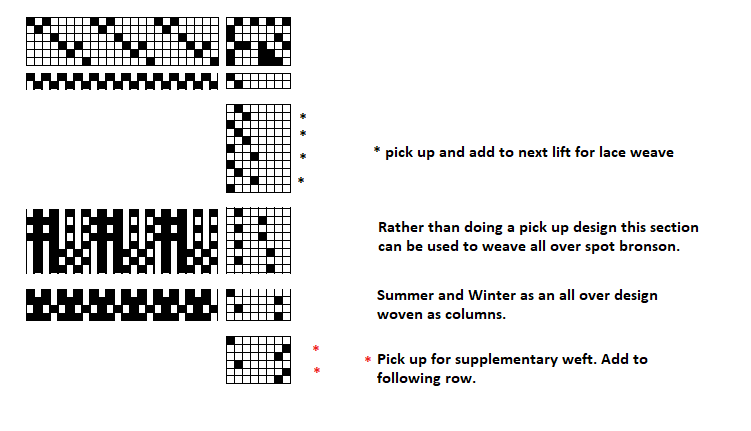 It’s interesting to note that when the direction of the pattern lifts are reversed and providing the same weaving sequence of two rows of plain weave for each lift is maintained, then each side of the motif looks different. Here’s a closer look. I like that both sides of the design are not the same: left to right and bottom to top. And a second one using a different coloured weft. Note the different twill direction. 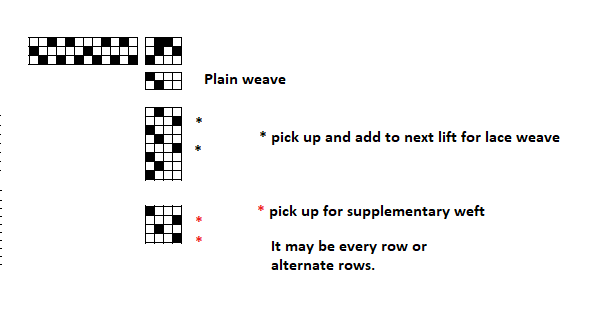 This second towel uses a different plain weave sequence. 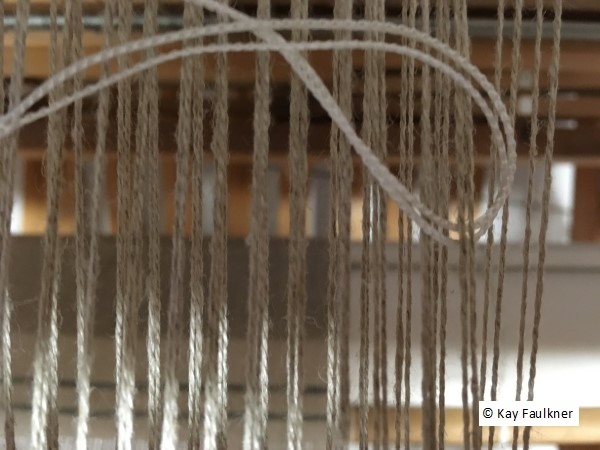 Weaving with the left and then the right treadle now becomes right then left and the direction of the twill line changes. Logical but fascinating! And there’s still enough for one more “play”. And that will be revealed next month. 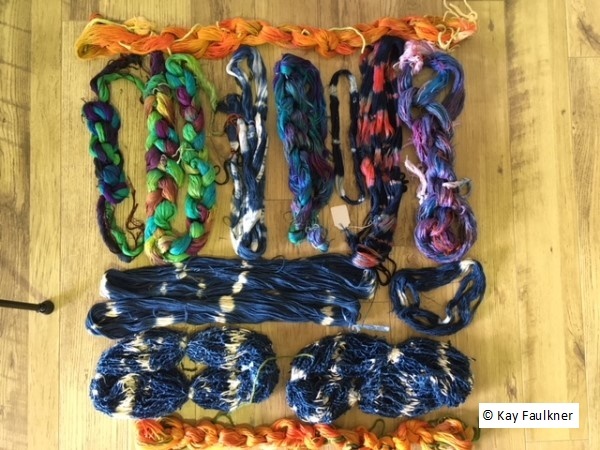 You are currently browsing the archives for the Loom controlled shibori/woven shibori resist category.